Happy Fall! I hope you all are having a terrific Fall Season. Since the leaves have been changing, I've been enjoying my walks in the evening the beautiful colors and patterns. I get so busy working during the day that having a little break to reconnect with myself, my husband and nature have been essential. I normally spend time in the morning drawing an inspirational phrase in my sketchbook that I feel I need to remember that day and some sort of freeform pattern. This helps get me out of my head and all of the things I need to do, and connect me with my creativity. One day on a walk, I began picking up some of these leaves. I had an idea to draw on them instead on in my sketchbook. I wasn't sure how or if it would work. But I like to pay attention when I have the question "WHAT IF....?". This question is the beginning of play and is essential to inspiration. 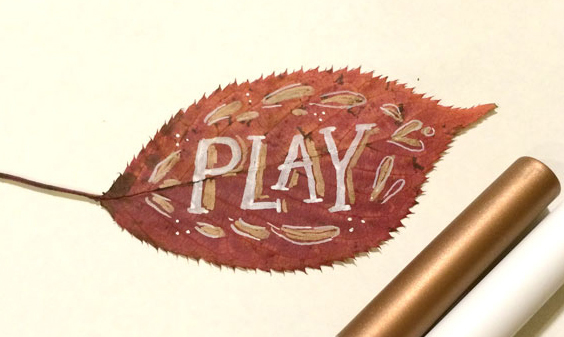 I loved how that first leaf turned out, so I've been creating more and sharing them on my Instagram feed. This isn't some giant success story, my Instragram following didn't suddenly grow to 10,000 and I didn't get offered a book deal or anything. I just created something that was fun for me and people seemed to enjoy it too. And it fulfilled my need for play, fun and exploration. So much of the time we are paying attention to deadlines and our to do list and we don't give ourselves time for fun. I find when I haven't made time for it I get grumpy. That's just a sign that I need to do whatever it takes to fulfill that need - soon! Play helps us learn and gets us out of our stuckness. Why don't we do it more? What do you that helps you get out of your head and into the realm of creative flow? It could be cooking, dancing, playing with your kids. See if you can commit to 5 or 10 minutes of play/ exploration this week and see how it impacts your life and your imagination.